&Gallery is a tranquil place for art lovers, showcasing fine art, drawing, painting and printmaking, complemented by ceramics, sculpture, glass and jewellery across the spectrum of contemporary visual and applied arts. The two spacious rooms down a few steps at 17 Dundas Street show distinctive, well curated monthly exhibitions. 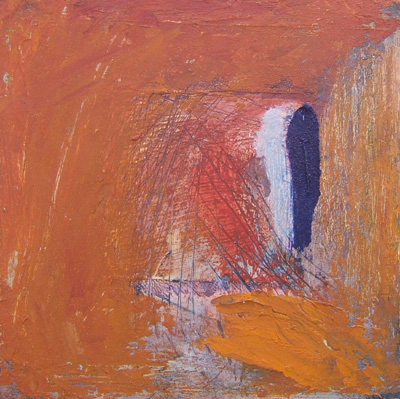 From 7th October to 1st November, 2017, Joy Arden is presenting a stunning series of dramatic oil paintings and monotypes, entitled “Time and Place”. Having moved to Edinburgh in 2003 from Ireland (her home for 20 years after graduation), Joy is based at the Coburg Art Studios, Leith. She is a specialist in printmaking, especially stone lithography. 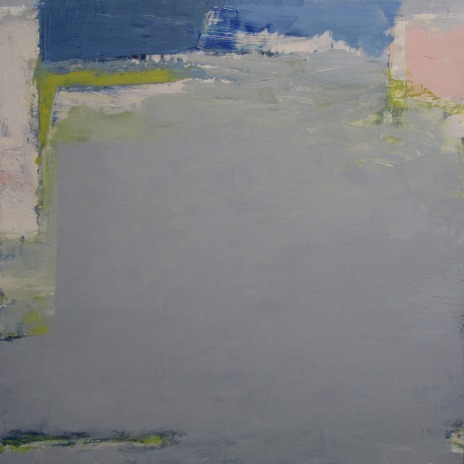 Having studied at a summer school at Edinburgh College of Art, she took an Advanced Painting course at Leith School of Art, where she was awarded the Elisa Clifford Prize, 2008 and then presented with the Anne Redpath Award – Visual Arts Scotland Exhibition 2011. Walk around &Gallery to be absorbed by an extraordinary portfolio of land and seascapes .. although such a defined term is not strictly correct as there are no particular locations – countryside, beaches, buildings, cities – named in any title. These are cool, creatively composed landscapes of the mind, the astute observation of a place as perceived by way of space, shade, tone and texture. 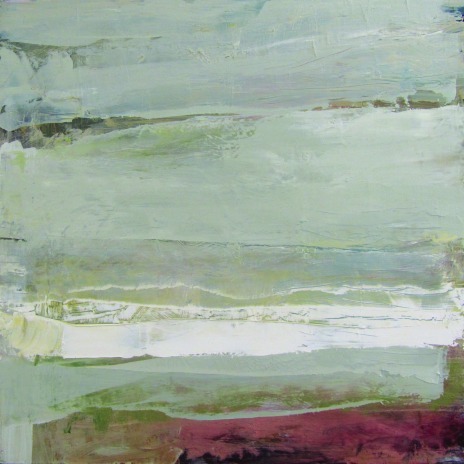 A captivating work is “Flow” with its bold, brash brushstrokes in thick oil, creating horizontal stripes in soft greys, cream, a touch of moss green and heathery plum. Each person, says Joy, will see what they feel and see in the painting, whether thick rain clouds, surfing waves, hills or a winter snowy landscape. This is also true of “ The Edge”, a stunning composition with carefully placed geometric shapes in rich blues, pastel pinky peach and grass green, surrounding the dominant grey central block. 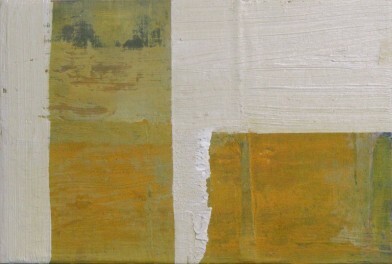 It does not matter where the actual place (if any) is depicted here, the artist has created a dialogue with the viewer. It encourages you to linger longer in front of each atmospheric painting . Aberlady Nature Reserve, East Lothian is a favourite place for Joy to wander with her sketch book, with its pretty woodland, sand dunes, a habitat for birds, but also lurking in the undergrowth are historic defence relics from World War II – linking the beauty of nature with the memory of man’s inhumanity to man. With the title “Time and Place” the subject matter is also a reflection of scenes through a time travelling journey, a place of the imagination like an artistic archaeologist. 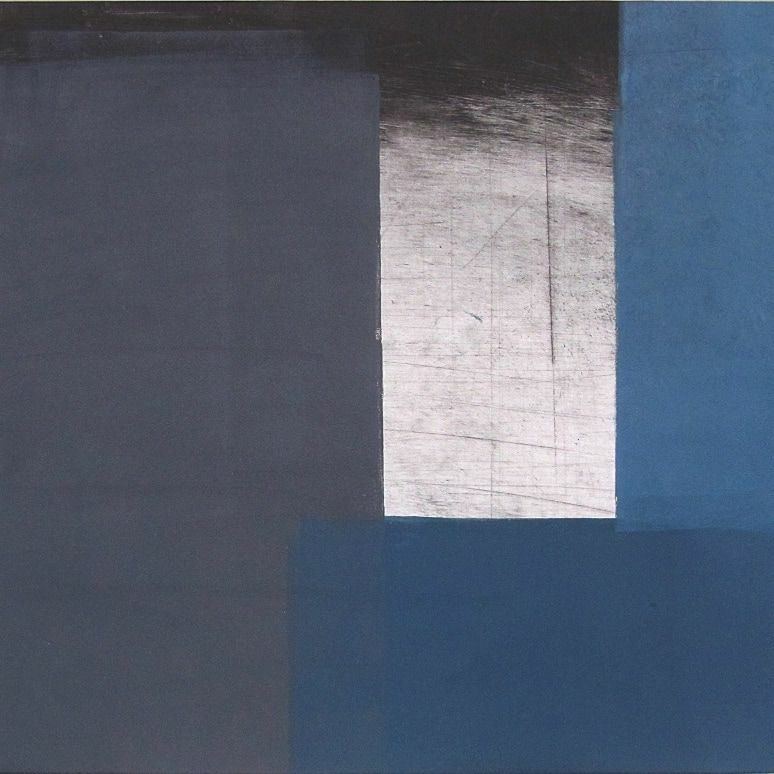 She has been inspired by the Prestongrange open air industrial heritage park in East Lothian to represent in fragmented manner, the distillation of its heritage. “ … traces of human activity evident in the remains of buildings and rusting machinery. Scattered fragments from its mining and pottery industries ….merge with the landscape”. 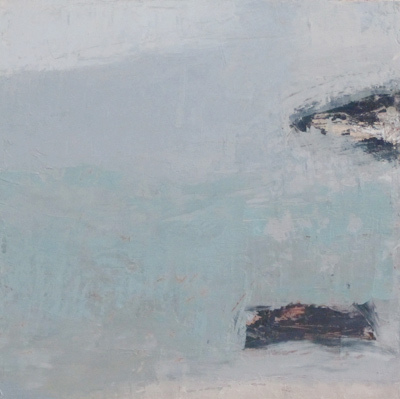 In all these paintings and prints, the environment is interpreted not in a realistic manner but through layers of softly muted, translucent and opaque colours to capture the essence of earth, water, light. 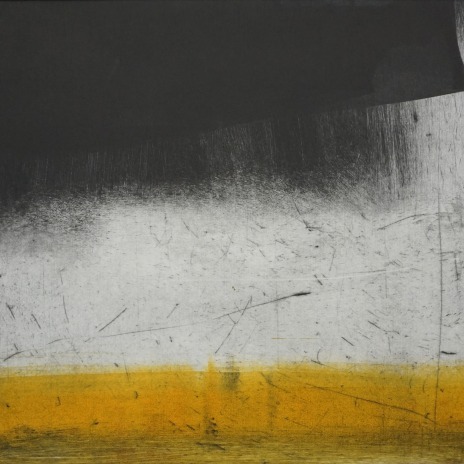 A monotype, entitled “Black /Sienna” is a surreal, dramatic blend of dark shadows against a shimmering glow and a bright streak of gold like sun-burnt terrain. Take a visit to &Gallery soon to experience the magic, mystery and mastery of these abstract representations of land, sea, history and heritage across our natural and man made world. 7 October to 1st November, 2017: Tues – Fri, 10am-5pm. Sat. 10am – 4pm.